This week’s ‘Living the Question:’ How do I make all the pieces fit? Next week’s Question: Why do bad things happen to good people? Links to each post in this series can be found in the introductory portion of this post. and I’m looking for the lessons in it. So far, I don’t like what I see. only there’s no charm to be found. Well, that’s last week’s news. covertly, through very leaky vessels. Like you. And like me. the miracle of a true friend. in this crazy, wide world. make it fit the facts. than I sometimes wish I knew. But then, that’s the way with questions, right? That’s the way with questions. 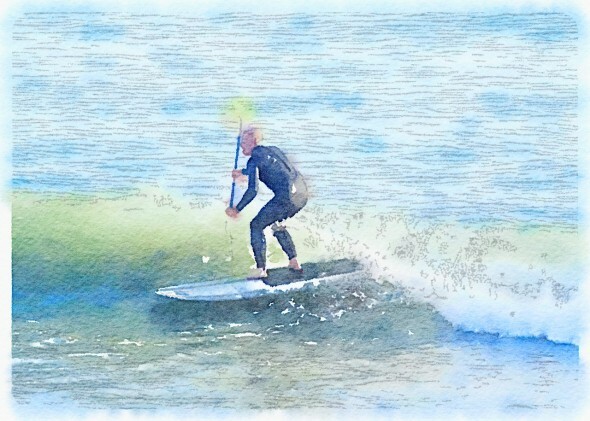 Not sure I feel exactly upright this week, but looking at this photo, ‘watercolored’ through a phone app, reminds me that it’s good to keep afloat whenever possible! Just these few quiet reflections for you all today as I continue to recuperate from the flu. I did find this wonderful comment today, from one of our regular conversationalists to another in the comments section of one of their blogs. A lovely summary statement of ‘making the pieces fit,’ I think. Please let me see your words on this important question. Maybe by wrap-up day, I’ll have a few more to add, but I’m not countin’ on it! Click on the froggie to link your specific blog post. It looks different because it is different. Starting last week, they changed the system. 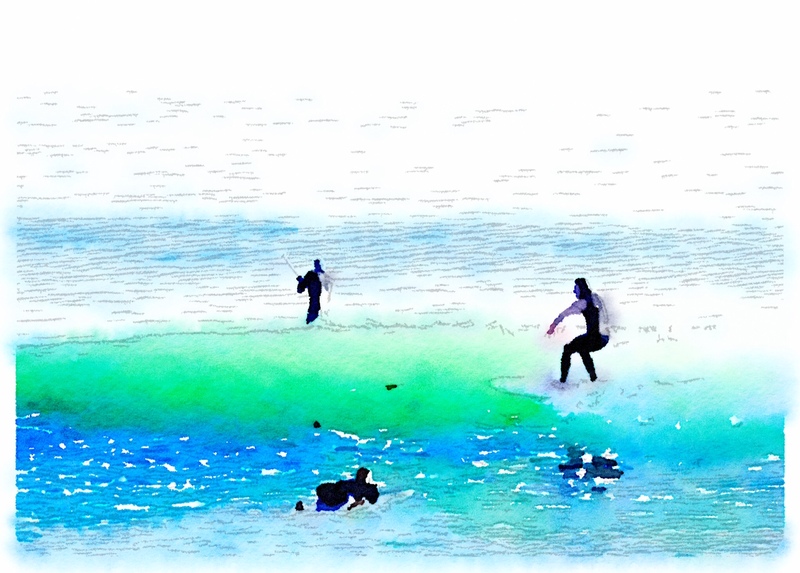 Filed Under: Beauty, Birds, Blogging, community, Confession, Encouragement, Hard Things, hope, Lament, Living the Answers, Living the Questions, Mystery, Q & A, Surfing! I have always loved a good watercolor. Your question is a great one. I’m not sure I have any good answers, but it seems to me that the pieces all come together in good time, even the ones with the more jagged edges. At least, I hope that to be true. I hope it to be true, too, Seth. And I’ve seen it play out in myriad ways over my life. But every time I land in a downward spiral, I tend to forget. So I write today to remind myself to remember. And to hang on, but not too tightly. Diana, this poem is masterful! How did I not know your penchant for poetry? Apparently, I’ve been the one missing out! Thank you for this. Profound in so many ways. Because there is no penchant for poetry, Kelli. This is just me, stream of consciousness and short line form fits it best. I don’t consider myself a poet at all. Thanks for reading, Kelli – always glad to see your sweet face here. diana, your beginning with the form of poetry was powerful. My word for the year last year was ‘Fit’, a word which spoke to me in many ways. A picture I continue to have in mind for what God is about is one of tumbled stones at the water’s edge (I have a photo of just such a pile). It was interesting last year when I was reading through the Pentateuch that God very clearly said that ‘no uncut stones’ should be used for an altar. For the life of me I can’t find out where that is, but it has stuck with me nonetheless. Why would He be so picky, I wonder(ed)? Because He is all about making us fit into the foundation He has in mind, that of a building He is forming–the body of Christ–and we can only fit when all those sharp edges are worn off. How cool that your word was/is ‘fit,’ so in line with this week’s question. I like the image of the stones in the Pentateuch very much – thank you. And thank you for your faithful reading and commenting each week, Jody. Means a lot to me. Jody, I love that insight you shared: Uncut stones are unfit for an altar. Gives purpose to the cutting we experience. I’m going to hang onto the thought, too. Love this poem, and the Tennyson allusion, and the living in tension, with questions. So hard, and so good. Thanks, Ann – your words carry special weight for me, always. Diana, I so love your honesty wrapped in hope. You also share wise insights such as: We learn about God and ourselves as we struggle in the valley between blessing and suffering. Good stuff that makes me think and makes me prayerful that I take full advantage of the valley-lessons. Thank you, Nancy. I want to take advantage of those lessons, too. That’s a little easier to do when we’re beginning to emerge from the low points, though, isn’t it? When everything went so “wrong” last year about this time, (newly retired, immediately having to alter our plans so we could care for my dad and and losing my retirment income two weeks after that with no good resolutions a year later) I remember describing it as having a puzzle amost completed, created with pieces that were prayed over, pieces that i believed God gave to me, ready to show to the world; then God came along, and not only scrambled the pieces, but turned the table over, the piece scattered all over and then he kept some of the pieces, and He wasn’t going to give them back to me again. Lots of tears, struggle and darkness later, I am at a place where (for today anyway) I expect God will help me put it back together again, and if he has any pieces I need, he will give them back to me and if some don’t fit anymore, He’ll give me some new ones. As I type this, I can’t believe I can say this today. It is God’s grace. That’s a terrible feeling, Carol – to see the puzzle knocked off the table, so to speak! I’m so glad that hope is emerging in the midst of all this pain, grateful for grace with you. Carol, as I have had (and continue to have) the amazing privilege of being mentored by you and a prayer partner with you, I have always had an overwhelming respect for your ability to be real through the pain. Your honesty and candor have been life-giving to me by providing a healthier path for me. For this I can only trust God will return the blessing to you, as my words of gratitude are not nearly enough! Love you! Thank you also for sharing Diana’s blog with me. I have already been blessed and know that it will be a tool for me to dig deeper into becoming all that God has intended me to be. Glad to have you with us, Kim! And how blessed you are to have Carol in your life as mentor and friend. thank you kim. You know you have been a blessing to me. there are times when a phone call from you was just the right timing or something NOT said was just the right words NOT to say! I love you too. I do believe this blog has played a part in being able to come through these last months to a better place. We all love diana here! I’ve been traveling this week, and now I’m home and just had to check in with you. My brain is a bit weary, so thoughts are fuzzy. But one notion bubbles to the surface: living in the tension involves a lot of trust and stepping forward, moving forward … even when we aren’t sure of where we’re stepping. Hoping for what is ahead while being all here. Like every week, I need to come back and read this again. Thank you for this meeting place, and I especially love reading the other comments. 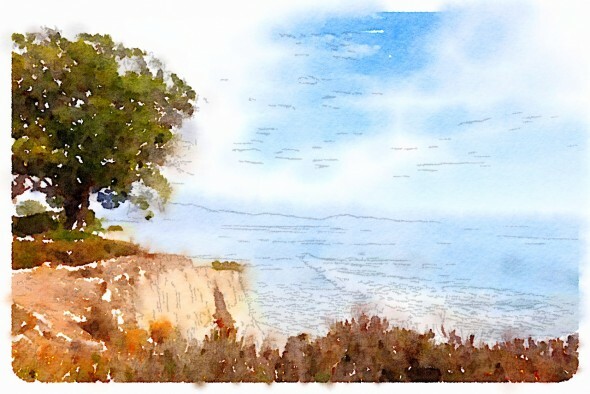 AND … the watercolor app is awesome! The conversation in the comments has been amazing, hasn’t it? I’m so grateful for each person’s words. And you’re exactly right – it is like stepping out into the dark a lot of the time. I think that’s where remembering is so important – remembering previous times of stepping out in faith can help us when the next dark chasm opens up. Glad you came by, Susan. How else can we do it? Our lives as shards of stone hewn in the fires of adversity while we’re in the process of becoming precious jewels to grace His throne. Works in progress growing and stretching painful into all we will be. Trying to stay afloat in a sea of uncertainty. I’m too tired right now to say more, though my linked up blog post expands this thinking. I remember trying to figure out life. Was it more good or more bad? I wondered, as if I could put all good and all bad in a scale and see which side weighed more. Eventually, it seemed to me that goodness is the ultimate thing, because God is good and doesn’t change, and some of that goodness pokes into our lives like rays from a sunburst. My struggle right now is the presence of both kinds of things inside of me. I can deal with it out there, but it’s in here, too. Despite yearning for what is good and beautiful and true, all too often I do or think wrong things. I just hate that. I don’t know if I’ll ever come to terms with it . . .
You are right, that dichotomy between good and evil runs right down the middle of each one of us. But here’s what I hang onto – every day, I am invited to keep choosing Jesus. And Jesus chooses me, whether or not I choose the right thing/thought every time I want to, or even every time I know I should. That’s the beauty of grace, for which I am grateful every.single.day. Diana, I just love what you have said here..I can choose Jesus, but he always chooses me! Such a gift, this wrestling. Yes, we are living in the tension of a world gone awry waiting for Aslan’s footfall. Sorry, we just finished The Lion, The Witch and the Wardrobe last night with the kids and oh, I feel this great ache for all to be set right with His Presence. I want to see the winter thaw, the evil drained from this world and His feet solid on our ground. I know that ache, Summer. And I thank you for linking up and reading. I’m hoping to get around to each link later today. This is one of those questions to which my short answer is ‘I don’t know.’ This doesn’t stop my brain from trying to figure it all out, however, which usually results in me feeling completely overwhelmed and mentally spinning round and round in circles! And that short answer is a great one, Donna. The only one most days. And you’ve started a blog!!! Hooray for you. First off, I can totally chime in on the bit about “not sure I feel exactly upright this week”, as a wicked virus has roared through our household for the last several weeks. I have been in such a fog, haven’t commented much on anything lately, for fear of realizing later that it said something like:dog. clouds and don’t forget the milk or some such gibberish. This is such a thought provoking series, and I thank you so much for the forum and to all the eloquent commenters, such beauty here of people sharing the real stuff of life. That one phrase ‘learning to live in the valley between’ would describe my evolving approach with God, I suppose. I am no longer interested in strident arguments and theological debates with winners and losers. I’m just trying to catch hints, glimpses of the beauty and how much He loves us all, despite the pain and the just plain evil in this world. I feel like I have been side-lined by life events the past couple of years, but it is time for me to dust off and see where, now that I’ve been softened around the edges, I can fit in. I SO get that ‘fog,’ Judy! It feels like we are pulling out of it the last 24 hours or so, and I’m grateful. I’m with you on the distaste for strident arguments and theological debates. And the line about ‘glimpses of beauty?’ YES! Thanks so much for reading and encouraging with your thoughtful comment.